As spring moves toward summer, the orders for play sand delivery start rolling in. Sure, our fleet of delivery trucks is still busy with top soil, gravel, mulch and sod deliveries some of the time. But the appeal of summer afternoons spent playing outside with the family really motivate our customers’ creativity. The play sand delivered by The Dirt Bag is exceptional, if we do say so ourselves. Smooth, creamy white and cool to the touch, it’s the perfect base for a backyard DIY project. We hear two primary complaints about backyard sandboxes. First, leaving the sand open to the sun can heat it up and make it uncomfortable for tiny hands and feet. And, of course, neighborhood cats and local wildlife often mistake the sandbox for their own personal porta-potty. A covered sandbox alleviates both problems! It also contains the sand and keeps it clean and pristine between play sessions. 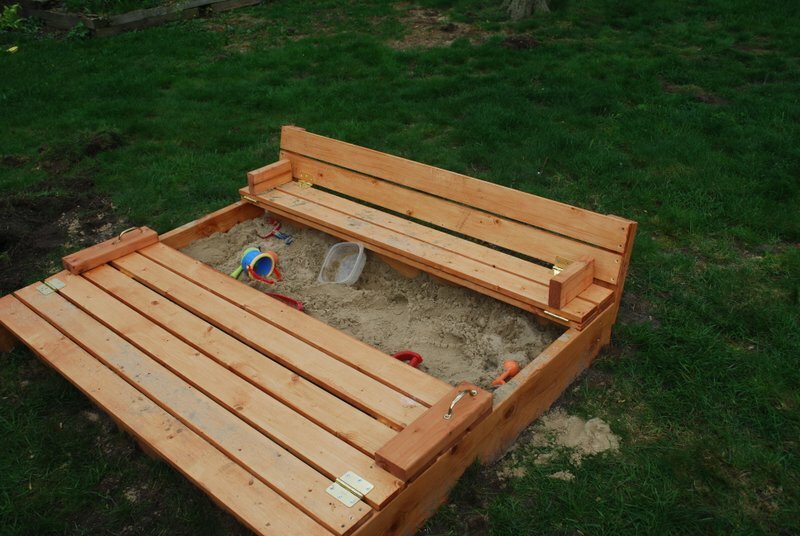 You can find a wealth of DIY plans online, many of which are free, like this covered sandbox with seats. Kids of all ages – and many pets! – love playing on the trampoline. Unfortunately, above-ground trampolines pose a risk for injury and, as a result, parents (and their insurance companies) don’t like them. Today, you can purchase an in-ground trampoline kit that eliminates much of the risk. By installing it in the center of a play sand pit, even kids who do take a tumble land in a soft bed of sand. Contact The Dirt Bag for local landscape company recommendations, and you can have your trampoline and play sand pit professionally installed! Whether you have a little sand left over or you save some out for more fun later, small-scale sand projects are both fun and educational for the kids. 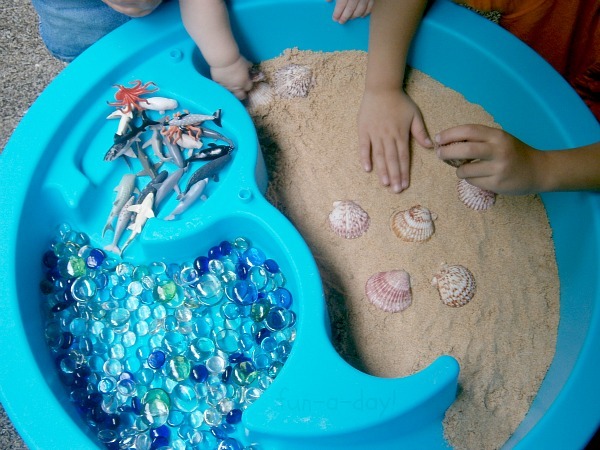 Child development experts suggest using sand for sensory play, to help kids develop their imagination and understanding of the natural world. This small world beach, set up in a child’s plastic play pool, will provide hours of creative fun for the entire family. This sand table is also a fun project that you can build in an afternoon. When the kids are done playing, simply close the top and serve lunch for the entire family! Whether you want to create your own backyard beach volleyball pit, add a beachfront entry for your swimming pool or simply make a fun spot for the kids to hang out this summer, play sand is a versatile and cost-effective approach. The Dirt Bag, serving customers throughout Northern Utah and along the Wasatch Front, specializes in delivery of garden soil, lawn fertilizer, sod, mulch and gravel. Contact us today to schedule your delivery, and get a jump on summer fun with play sand.